In the “Six degrees of separation” department, here are a few more words on the Rev Benjamin Franklin Cooley [1835-1913], born twenty years before Halsey Wood and outliving him by sixteen. I’ve invoked Fr Cooley here before, at a different blog and in the context of Holy Trinity Episcopal Church in Lisbon, Dakota Territory, a congregation he helped to found and whose church design he influenced. From his base in Fargo, DT, Father Cooley became the Episcopal counterpart of a circuit rider, itinerant clergy who routinely service multiple congregations, usually on a cycle of visitation. 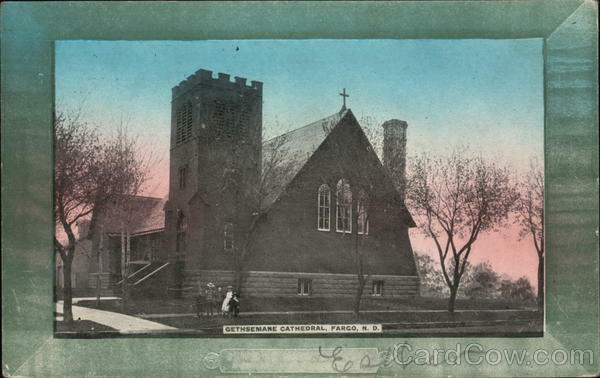 Holding a normal Sunday service at Christ Church [later renamed Gethsemane], Cooley would board a train for the 25-50 mile journey to Mayville, Casselton, Buffalo, Lisbon, and other hamlets not large enough to support their own resident priest. Cooley was the right person in the right place at the right time: a “high church” Anglo-Catholic with a passion for ritual and its proper setting. He and his wife Ellen had come to Fargo in 1881 with the likely mission to establish the Episcopal denomination in an area already peppered with Methodist, Congregational, Presbyterian and the occasional Baptist churches. With Roman Catholics already firmly established, Episcopalians had to play catchup, and Cooley was soon joined by another ideal collaborator: emigrant architect George Hancock [1849-1924], educated in England and no doubt sporting a proper British accent in an essentially Yankee population. The dynamic duo of Cooley and Hancock set about creating a de facto corporate image for the Protestant Episcopal church: Cooley organized a parish and found resources to build (materials and money) and Hancock served as architect — though that division of labor may be too absolute. They were able to work so closely because the bishop was situated hundreds of miles away in Omaha; Rt Rev Robert Harper Clarkson administered his own diocese of Nebraska, as well as the missionary jurisdiction of Dakota, incorporating the entire area of what would become North and South Dakota. Clarkson died in 1884, just 58 years old and already worn out by the magnitude of the task. Cooley and Hancock were joined by Rt Rev W. D. Walker, elected bishop of a newly established Missionary Diocese. The three-way division of labor allowed Cooley to focus on parish organization, Walker to raise funds [he spent more time out of the diocese than in; he was well connected in the East], and Hancock provided design serves and construction supervision. It may have been an ideal relationship, because the product is still scattered from Lisbon to Devils Lake. Right now you may be asking yourself two questions: Who is this Cooley guy and what are his clerical and architectural credentials? And what circumstances might have crossed his path with that of William Halsey Wood? Fair enough. Born into the modestly prosperous Cooley family of Granville, Massachusetts. Made a deacon in 1861 in Connecticut. Attended Nashotah Seminary in Wisconsin for a year some time in the early 1860s; Nashotah is renowned for its “high church” traditions. Cooley’s record there is slim: he was remembered as being “all music”. Ordained in 1865 in Massachusetts by Bp Manton Eastburn who, it should be noted was decidedly not High Church. This eventually got him in trouble. Married in January 1867 to Ellen Josephine Hodges, who plays heavily in the story much later. Rev and Mrs Cooley led a peripatetic life, as many clergy do, serving congregations in Connecticut, New York, and at multiple places in Massachusetts before being disciplined by Eastburn for the “Romish” quality of his service. About this time, Cooley was in charge of Christ Church, Medway, where he worked with architects to design their new church. 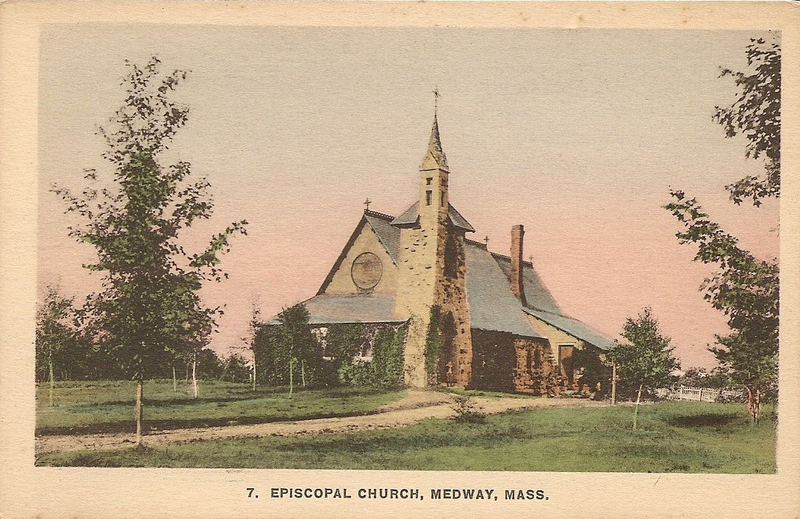 When things got too hot with Manton Eastburn, Cooley “hid out” in the handful of High Church parishes that existed in New England, chief among them St Anne’s, Lowell, and nearby Chelmsford. But in one case he left the region for several months and became head of music at the House of Prayer in Newark, New Jersey. Would it surprise you to learn that the choir director at the House of Prayer was one William Halsey Wood, budding architect and whose churchmanship equaled that of Cooley. For reasons not yet known, Cooley accepted the call westward and came to Christ Church, Fargo, in Dakota Territory, a position he held from 1881 until being summarily dismissed for unspecified charges — though I suspect what they may have been. After leaving Fargo in November 1885, Cooley went to parishes in Sycamore, IL, Milwaukee and Eau Claire, WI, and finally back to familiar turf in New England. So far, so good. Cooley has met Wood and no doubt found much to talk about. The architecture of frontier churches was often put in the hands of itinerant carpenter–builders with little experience in the design of Episcopal churches for Anglo-Catholic services. What they often got were rude wood boxes without even proper liturgical orientation. So bishops like Robert Clarkson [remember him?] put out a call for eastern architects to volunteer their services in the interest of improving the quality of frontier architecture, the theory being one such church could serve as a model for others and raise the general quality of design. Bishop Clarkson did just that and employed Henry G. Harrison for the Gothic Revival cathedral at Omaha, Henry Rutgers Marshall for Bismarck, and Charles M. Burns for Sioux Falls. William Halsey Wood was also called into service, designing church in Kansas City, and the cathedral in Laramie, Wyoming, probably never visiting either site. There is evidence that Wood was also consulted on the cathedral in Boise, in addition to having designed St Margaret’s School for Girls there. Fast forward to the 1890s. Dakota Territory had become two states but a sequence of bad winters and decimated both agricultural production and livestock. Those conditions were compounded by the Panic of 1893, one consequence being a downturn in population growth, so the construction of a proper cathedral in Fargo was delayed. In the meantime, however, Bishop Walker had consulted Halsey Wood on one of his eastern tours of fund raising. Wood provided a potential design — probably an unbuilt project for another client — but that was rejected for unknown reasons and, instead, a more conservative (and probably economical) design came from local architect George Hancock. Even that was beyond the budget, for Hancock’s original design in masonry was built in wood and painted red. WHW designed the second Fennimore County court house in 1888. WHW designed a house in Orange, NJ for C. S. French, a house that served as the basis for a doll house Anson built for his sister Claire in 1905. 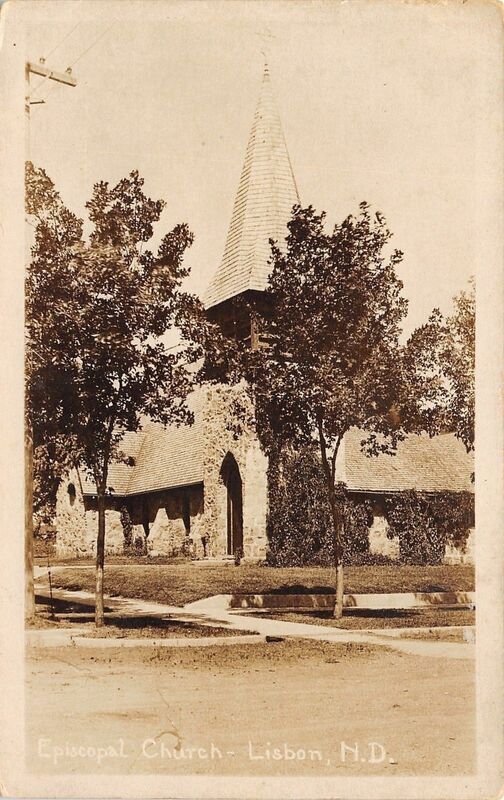 WHW design the Episcopal church at Mantoloking, NJ, which Anson and his family visited in the summer of 1912. Anson returned home and crafted a set of building block based on that church. The peripatetic Father B. F. Cooley made a six-month stop at Saint-Joseph-the-Carpenter on his return eastward.